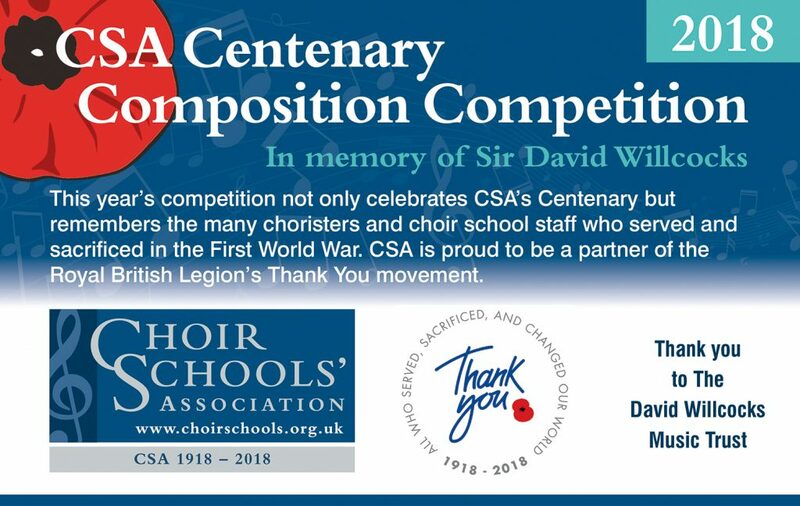 CSA is delighted to announce the results of its Centenary Composition Competition 2018. We have three winners! Many congratulations to Benedict Braddock and Harry L’Estrange who are joint winners of the Under 14 Age Group. Benedict, 11, is a pupil at Dean Close Preparatory School, Cheltenham and a chorister in Tewkesbury Abbey’s Schola Cantorum. 10 year-old Harry is a pupil at St John’s College School, Cambridge and sings in St John’s College Choir. This year’s competition was opened up to all pupils and choristers at choir schools and in cathedral choirs belonging to CSA. It also saw the introduction of a new category from 14-18 with the first-ever winner being Meadow Brooks, 17, a pupil at Wells Cathedral School. Meadow won quite a following as the percussion finalist in this year’s BBC Young Musician of the Year. We would also like to congratulate Jonathan Jolly (Norwich School) whose entry was commended in the senior section and Edward Harris-Brown (Chetham’s School of Music) and Thomas Sparkhall (The Pilgrims’ School, Winchester) who were commended in the under 14 group.